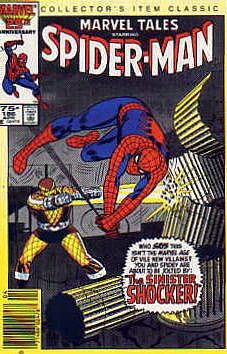 Marvel Tales #186: The Sinister SHOCKER! Summary: While still nursing an injured arm from the previous issue, Spidey interrupts the Shocker at work, a fairly routine robbery. 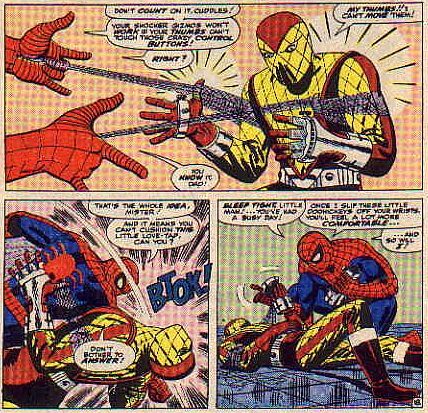 However, before we realize, Shocker proves to be a formidable foe, and handily gains first victory over the wall-crawler. Spidey recovers later, and after a few close calls on his secret identity, he's back on the trail of ol' Shocky. There's also a brief origin account of the Shocker (he's basically an inventive thief who developed his shock powers while trying to escape from prison). Spidey dopes out that his powers come from his costume, and the rest is history. There are some really great action scenes between the two, but here's the climax of the story. The Good: I LOVE John Romita (Sr.)'s artwork. Always have. Always will. But unfortunately it's hard to find cheap... except in Marvel Tales. These are always great finds. The Bad: Ok, so Shocker's an inventive thief. And Peter Parker's got some personal problems. 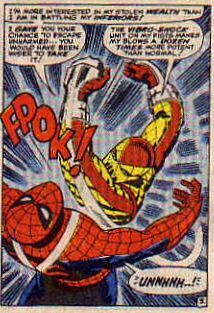 It would be great to see Spider-Man take Shocker as a more personal threat... say, if he menaced Gwen or even Jonah Jameson while trying to escape.